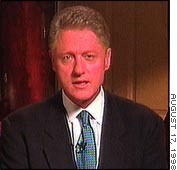 WASHINGTON (AllPolitics, February 12) -- After his acquittal by the Senate, President Bill Clinton apologized again to the nation Friday for his actions which prompted the yearlong Monica Lewinsky ordeal. The president's first attempt at remorse -- his August 17 address to the nation when he first acknowledged the affair -- was widely panned as long on venom toward Independent Counsel Ken Starr and short on contrition. 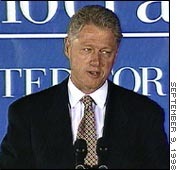 August 17: "I did have a relationship with Miss Lewinsky that was not appropriate. In fact, it was wrong. "I misled people, including even my wife. I deeply regret that." August 28: "I'm having to become quite an expert in this business of asking for forgiveness." September 2: "You know, I have acknowledged that I made a mistake, said that I regretted it, asked to be forgiven, spent a lot of very valuable time with my family in the last couple of weeks, and said I was going back to work." September 4: "I made a big mistake. It is indefensible and I am sorry. "I can't disagree with anyone else who wants to be critical of what I have already acknowledged is indefensible. There's nothing that he (Sen. Joseph Lieberman) or anyone else could say in a personally critical way that I don't imagine I would disagree with since I have already said it myself, to myself, and I'm very sorry about it, but there's nothing else I can say." September 9 (afternoon): "I also let you down and I let my family down and I let this country down. But I'm trying to make it right. And I'm determined never to let anything like that happen again. And I'm determined to redeem the trust. "So I ask you for your understanding, for your forgiveness on this journey we're on. I hope this will be a time of reconciliation and healing." September 9 (evening): "I've tried to do a good job taking care of this country, even when I haven't taken such good care of myself and my family and my obligations. I hope that you and others I have injured will forgive me for the mistakes I've made, but the most important thing is you must not let it deter you from meeting your responsibilities as citizens." 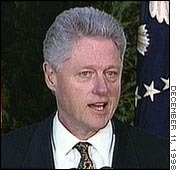 With the momentum on Capitol Hill moving towards his impeachment, Clinton made a last-ditch personal apology on December 11 to members of Congress and the American people. The next the day the House impeached him. 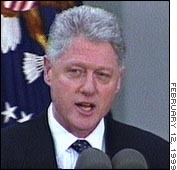 December 11: "What I want the American people to know, what I want the Congress to know, is that I am profoundly sorry for all I have done wrong in words and deeds," Clinton said. "I never should have misled the country, the Congress, my friends and my family. Quite simply, I gave in to my shame ..."
"Mere words cannot fully express the profound remorse I feel for what our country is going through, and for what members of both parties in Congress are now forced to deal with. "These past months have been a tortuous process of coming to terms with what I did. I understand that accountability demands consequences, and I'm prepared to accept them. Painful though the condemnation of the Congress would be, it would pale in comparison to the consequences of the pain I have caused my family. There is no greater agony." February 12: Now that the Senate has fulfilled its constitutional responsibility, bringing this process to a conclusion, I want to say again to the American people how profoundly sorry I am for what I said and did to trigger these events and the great burden they have imposed on the Congress and on the American people. Now I ask all Americans, and I hope all Americans, here in Washington and throughout our land, will rededicate ourselves to the work of serving our nation and building our future together.